How do I say this? 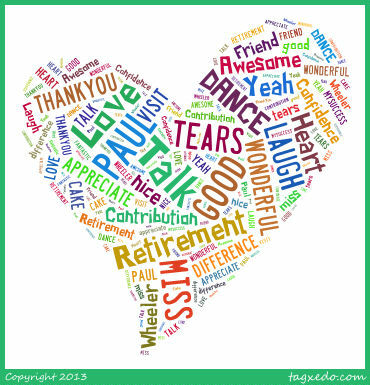 Finding the words to describe what happened during Paul’s last day of work at Semiahmoo House Society is somewhat of a challenge. We were together, we ate cake and we took pictures. Typically, the word that would come to mind is “celebrate”, but if you look up the word, the first definition is “show happiness at something”. This is definitely not fitting because nobody was happy about Paul’s leaving. Looking down the list of definitions, more appropriate synonyms emerge: acclaim, commend, applaud, remember, honour and praise. That is how 250 people celebrated Paul on his last day as Executive Director. Over his 15-year tenure, Paul created many programs that touched the lives of people and made a difference in the community. During Paul’s Retirement Tea, people who participate in those programs lined up at the microphone waiting their turn at the chance to tell Paul their heartfelt farewell. While they spoke, a theme was clearly emerging as illustrated in the word cloud. 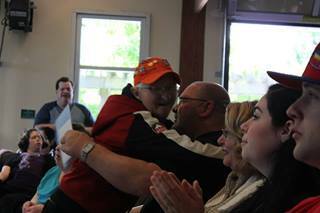 People further expressed their gratitude by presenting Paul their beautifully crafted creations. Paul and Janet, his wife, were visibly moved as they approached the podium. Thank you for everything, Paul Wheeler. We love you and miss you. Come and visit often. This entry was posted in Blogs by Louise Tremblay, Staff Features, Uncategorized and tagged developmental disabilities, retirement by The Semiahmoo Foundation. Bookmark the permalink.